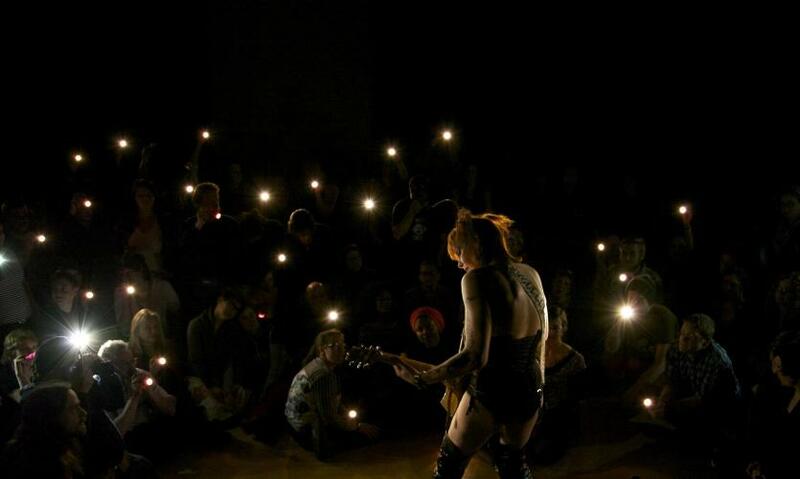 A scene from the 2014 Culture Wars Cabaret hosted by Patrick’s Cabaret. Photo by Ryan Stopera. Patrick’s Cabaret announced today that it will close permanently this summer. The surprise announcement stunned many in the Twin Cities; the organization has been a fixture in the Twin Cities performing arts scene for 31 years. The announcement took many local artists by surprise in part because of its suddenness. Unlike Intermedia Arts, which took several public steps to stem the red before shuttering last year, Patrick’s Cabaret gave little prior notice that a closure was even under consideration. In a statement released today, Executive Artistic Director Scott Artley reflected on the organization’s changing mission and how that mission was impacted by the loss of its longtime home. From 1999-2016, Patrick’s Cabaret was based at an old firehouse in the Longfellow neighborhood of Minneapolis. As area property values rose, however, the owner sold the property for redevelopment, forcing the company to become nomadic. “Without a permanent venue to anchor [Patrick’s Cabaret’s] transformation of identity,” Artley noted, “and without the flexible earned income we once generated through venue rentals, we know that in less than a year we will be unable to raise the financial resources necessary to sustain the organization’s work, much less conduct a capital campaign to secure a new building on a realistic timeline.” As a result, the organization’s leadership and Board of Directors decided to “sunset” Patrick’s Cabaret through a planned shutdown. “The decision to sunset Patrick’s Cabaret with so much advance notice,” Artley said in the statement, “allows the organization the rare opportunity to share one final amazing season and conclude the organization’s lifespan with integrity and positivity.” The organization is still fundraising to support its final 2018 spring season. This is not the first time that Patrick’s Cabaret has been shuttered – it had a half-year closure in 1996 due to permitting and licensing issues – but it looks to be the final one. Mindful of the benefits of a permanent home, its leadership tried in the mid-90s to purchase the building that became home to Open Eye Theater. When that deal fell through, an anonymous donor eventually offered to purchase a space and lease it to the Cabaret – the firehouse that became its home for 17 years. Patrick’s Cabaret will leave behind a legacy of boundary-pushing and sometimes controversial art. A 1994 performance by Ron Athey is often cited for triggering the 1990s Culture Wars, including a broad debate over federal funding of the arts. This attention is arguably unfair, reducing the life-changing impact of decades of other programming to focus on a single, much-reported issue. Thousands of artists and audience members have passed through its doors over the years; in interviews conducted by Arts Reader staff, the Cabaret is often cited by queer artists as a favorite place to perform, a first artistic home, and a nurturing ground for making art that seemed to have no other place to exist and flourish. As Artley noted in his statement, Patrick’s Cabaret frequently transformed itself to stay on the edge, including engaging groups that found themselves estranged by society and artmaking. Its most recent transformation focused on serving “artists and audiences on the edge of culture” such as “artists of color, with disabilities, and with queer and trans identities”. After exiting the Longfellow firehouse due to the building’s sale in May 2016, Patrick’s Cabaret obtained office space in the Intermedia Arts building – a piece of real estate that is itself now up for sale, due the latter organization’s financial problems. The rich legacy of Patrick’s Cabaret will be hard to replicate, especially as real estate prices climb in the gentrifying Twin Cities. Our work strives to center artists of color, with disabilities, and with queer and trans identities. We grow new art and new artists by encouraging artists of all experience levels to try new things, take risks, and present works-in-progress. We connect artists to education, performance platforms, tangible resources, and to each other, to put their talents to work. We build a diverse network of artists committed to forwarding a radically inclusive and progressive creative community where artists on the margins can thrive. We believe artists are critical agents for broad community change. We believe queer identity is a lens through which we fight for justice and liberation for all marginalized communities. We believe our role in the Twin Cities arts ecology is to support artists who are doing challenging, experimental, subversive and community-driven work that might not otherwise find a home. A visual retrospective of Patrick’s Cabaret, created for its 30th anniversary, is available online.